IRVINE, Calif. (January 4, 2017) – The two-car Mazda Prototype team has confirmed the driver lineup that will compete in the top category of the 2017 IMSA WeatherTech SportsCar Championship. For the third consecutive season, the drivers for the full 10-race championship season are Jonathan Bomarito, Tom Long, Joel Miller and Tristan Nunez. For the season-opening Rolex 24 at Daytona, Verizon IndyCar Series drivers James Hinchcliffe and Spencer Pigot will join the driver lineup in the all-new Mazda RT24-P race cars under the new Daytona Prototype international (DPi) rules. The No. 70 ModSpace/Castrol Edge Mazda Prototype (Gunmetal Grey livery) will be driven by Long, 34, of Charlotte, N.C., and Miller, 28, of Hesperia, Calif. The duo finished sixth in the 2016 Prototype driver points championship after five top-five finishes. For the 55th running of the historic Rolex 24 at Daytona, Long and Miller will be joined by IndyCar race winner James Hinchcliffe, 30, of Toronto, Canada. Hinchcliffe finished second in the most recent season of “Dancing with the Stars” on ABC-TV, and will race with Mazda at Daytona for the fifth time since 2012. The No. 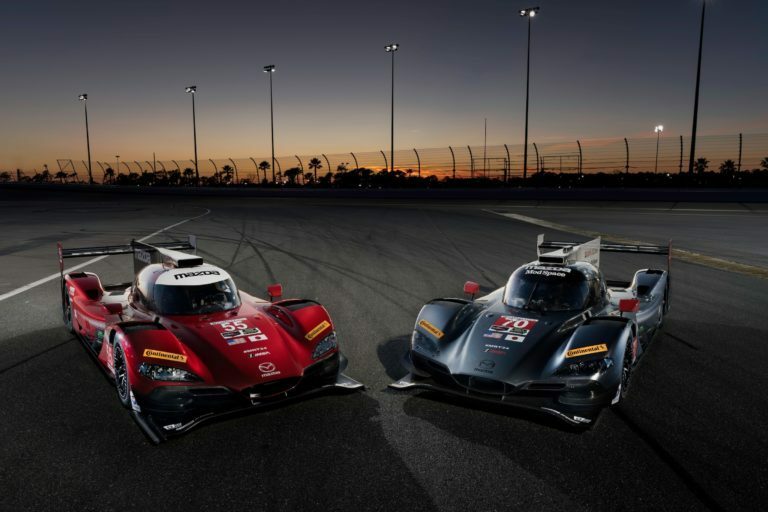 55 Mazda Prototype (Soul Red Crystal livery) will be driven for the third consecutive season by the pairing of Jonathan Bomarito, 34, of Louisville, Tenn., and Tristan Nunez, 21, of Boca Raton, Fla. Bomarito and Nunez recorded a league-leading three pole positions in 2016, led six races, and finished seventh in the final Prototype driver point standings. Spencer Pigot, 23, of Orlando, Fla., will join the No. 55 team for the second year at Daytona. The IndyCar driver made his Prototype debut with Mazda last year at Daytona, then raced at Sebring before leading races at Watkins Glen and Road Atlanta. For this weekend’s Roar Before the 24 test sessions at Daytona, driver Ben Devlin, 34, of Norwich, England, will also join the team, utilizing his extensive prototype experience to help hone the preparation of the two Mazda RT24-P race cars. (Twitter: @JBomarito) Bomarito won the 2010 Rolex 24 at Daytona in the GT category, driving a Mazda RX-8 for SpeedSource with co-drivers Sylvain Tremblay, David Haskell and Nick Ham. Bomarito, who grew up in Monterey, Calif., won the 2003 USF2000 open-wheel championship, was a race winner in the Mazda-powered Atlantic Series, raced at Le Mans and nearly won the 2014 IMSA GTLM drivers championship before his stint in the Mazda Prototype. Bomarito is largely considered one of the top drivers at his home track of Mazda Raceway Laguna Seca. This is slated to be his 11th start in the Rolex 24. Bomarito returns as a Mazda factory driver one again. (Twitter: @Hinchtown) Hinchcliffe missed the 24-Hour race last year as he recovered from near fatal injuries suffered at Indianapolis in 2015. He returned to win the pole position for the 100th running of the Indianapolis 500 in May, 2016. (Twitter: @TomLongRacing) Long has been a part of Mazda’s racing family since 2004, making 2017 his 14th season driving with Mazda. Long was the lead development driver on Mazda’s Global MX-5 Cup car that debuted in 2016, and this year will mark his seventh start in the Rolex 24. When he led the race overall at Daytona in 2015, it was the first time a diesel-powered vehicle led the historic endurance race that has been contested since 1962. (Twitter: @JoelMilleracing) Miller came through the Mazda Road to Indy open-wheel program before he became part of Mazda’s endurance sports car effort. He is the current driver coach/mentor for the USF2000 series in the Mazda Road to Indy. A degreed mechanical engineer, Miller is a lead presenter of Mazda’s national-touring STEM education program, and will be making his fifth 24-Hours start this month, all with Mazda. (Twitter: @TristanNunez) Nunez holds the record as the youngest champion in a professional class of road racing in North America. He won the IMSA Prototype Challenge presented by Mazda (nee: Prototype Lites) series in 2012 with 11 wins at age 17. He became a Mazda-backed driver after winning the prestigious open-wheel Walter Hayes Trophy event at Silverstone, England. Nunez does presentations across the country on behalf of his own “Dnt txt n drV Foundation,” which is devoted to educating young people about the dangers of distracted driving. (Twitter: @SpencerPigot) Pigot embodies the Mazda driver development scholarship program called the Mazda Road to Indy. The first (and still only) driver to win four Mazda scholarships, Pigot won the 2014 Pro Mazda and 2015 Indy Lights championships. He utilized his Mazda scholarship to compete in the 100th running of the Indianapolis 500, as well as the road and street circuit races in IndyCar in 2016 with Rahal Letterman Lanigan Racing and Ed Carpenter Racing. Pigot, along with teammates Miller and Bomarito, is a member of the Mazda Road to Indy Hall of Fame. Mazda Motorsports boasts the most comprehensive auto racing development ladder system of any auto manufacturer in the world. The Mazda Road to 24 (#MRT24) program offers a number of scholarships to advance drivers up the sports car racing ladder, beginning with the Global MX-5 Cup series and culminating with the Mazda Prototype team. The Mazda Road to Indy (#MRTI) is a similar program that includes Mazda-powered categories of USF2000, Pro Mazda and Indy Lights. In grassroots road racing, more Mazdas race on any given weekend in North America than any other manufacturer. Mazda is also the title sponsor of the renowned Mazda Raceway Laguna Seca in Monterey, Calif. Follow all of the latest news at MazdaMotorsports.com, @MazdaRacing on Twitter, and MazdaMotorsports on Instagram and Facebook.